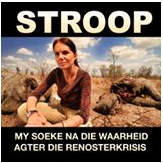 STROOP is an independent documentary feature film on the rhino poaching crisis, which the world needs to see. The filming over two-and-a-half years has been publicly funded and now the film is in edit and finishing up last interviews before its release in 2017. The word STROOP in Afrikaans means poached but also stripped bare… one ploughs the corn fields stripping them bare. So stripping the rhino, its being, its essence from what makes it a rhino. The film is in Afrikaans, Shangaan, Vietnamese, Chinese and English. It will have english subtitles throughout. The film is being made by well-known wildlife television presenter Bonné de Bod and filmmaker Susan Scott. 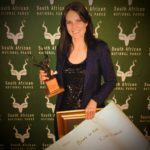 Bonné has been presenting wildlife stories on South African television for nearly a decade while Susan has been making National Geographic and Discovery/Animal Planet documentary films for nearly twenty years with some of the best wildlife and documentary filmmakers on the planet. The duo have won numerous awards for their work, ranging from multiple SAFTAs and Kudu awards, to wildlife film festival awards, an ATKV Media Veertjie, and most recently the prestigious SANParks Best Journalist Award for Bonné and two SAB Environmental Media Awards for Susan’s writing and photography documenting STROOP. STROOP’s filmmakers, Bonné and Susan have self-funded a majority of the film, and received generous donations from the public to shoot the film for two-and-a-half years now. Many distributors and broadcasters have expressed interest in the film, but once the film is sold to the “industry” it loses its independent nature and may have to be cut down or have scenes cut out for government interests or to appease advertising clients. It is vital that the film be made entirely without corporate control to ensure that the true story of what is happening on the ground is seen. The only way to do this is to ask the public to pre-buy copies of the film, buy STROOP products or donate towards the film. By making you, the public, pay for the film, we avoid having to work for a broadcaster and their mandates which means no censorship from television executives over a controversial film like this. Bonné is not picking sides in the story she will tell. 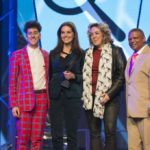 She will ask the questions that any ordinary South African would. The filmmakers are bringing the information from the battleground straight to you. We will look back at this time and wonder if this was the turning point and what was being done to stop the eradication of our rhinos in the wild. This has to be documented for the future and to help us understand NOW what HAS to be done. Thank you so much for supporting us and making sure this film gets made.